Music lover, salty yachtsman, photographer, skier, teacher, computer geek. He was a man who believed in working to live, rather than living to work. He loved to teach what he knew to whomever wanted to learn. He earned his Eagle Scout in 1964. Member of Outward Bound Hurricane Island class of 1965. Member of Hamilton-Wenham Regional High School class of 1966. He served in the Navy from 1968 to 1972, sailing aboard the USS Enterprise aircraft carrier as a Com/Nav inspector on Corsair II aircraft. He began a long career in Information Technology in 1974 and remained in that field until his retirement. An active supporter of the Boy Scouts of America, he served in many adult leadership roles including Scoutmaster. He attended the National Boy Scout Jamboree in 1983 as an Assistant Scoutmaster. He was a recipient of the Silver Beaver Award. 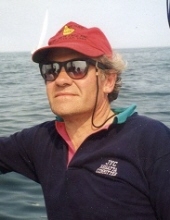 An avid sailor, he began his storied life of boat ownership in 1979. He joined Jubilee Yacht Club in the early 1980s and served many years on the Regatta Committee. He served as Commodore of Jubilee Yacht Club in 2010. He was a dedicated racer and could be found on the course most Wednesday nights, Thursday nights, and most weekends. Served as Commodore of PHRF NE. His wife, Janet Foley MacNeill. His children; Mark MacNeill, Nathan MacNeill, and Amy MacNeill Rickey. His granddaughter, Luciana Rickey and son-in-law, Chris Rickey. His brother, Richard MacNeill and wife, Cheryl. His sister, Jane Mitchell and her husband, Deane. Many nieces, nephews, grand nieces, and grand nephews. Members of the Foley family who became family by marriage, but also became friends. To send flowers or a remembrance gift to the family of James M. MacNeill, please visit our Tribute Store. "Email Address" would like to share the life celebration of James M. MacNeill. Click on the "link" to go to share a favorite memory or leave a condolence message for the family.